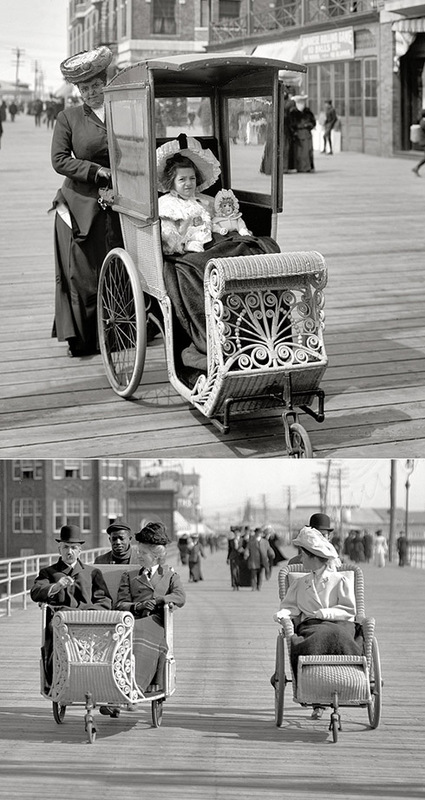 "The Dennis, Atlantic City, 1901." Decades before The Donald came to town. 8x10 inch dry plate glass negative, Detroit Publishing Company. View full size. Submitted by archfan on Sun, 06/12/2016 - 12:08am. 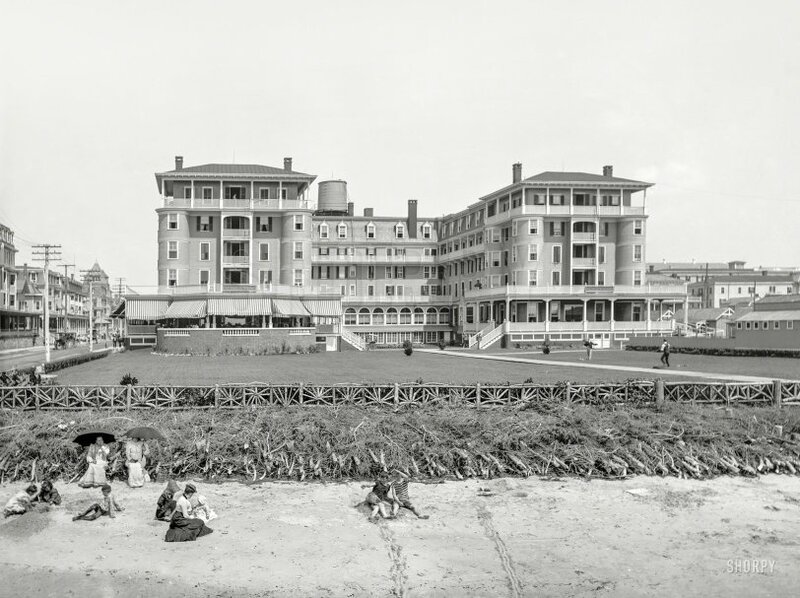 "The latest version of the Dennis, pre-casinos, was constructed between 1919 and 1925, Kutschera said. It was built in the French regency style, with a distinctive mansard roof." Submitted by Bilfer on Sat, 06/11/2016 - 4:43pm. Anyone have any idea of where in AC this hotel was. I will be going to AC in 3 weeks and would like to see what's there now. Submitted by Vidiot on Fri, 06/10/2016 - 3:16pm. Although those don't look like Scotch Pines and Doug Firs, they may be there for the same reason hundreds of New Jersey towns, at least throughout my youth, used to collect used Christmas trees at curbside and send them on a seaside excursion. Yes, it was for erosion control, they claimed... possibly to keep the sands from swirling and shifting during the rough winter-spring transition. Submitted by WJBrennan on Thu, 06/09/2016 - 9:51am. The kid in front of the two ladies looks like he fell out of a Winslow Homer painting and landed on the beach. Submitted by BillyB on Thu, 06/09/2016 - 9:41am. Why are all the trees stacked up on the beach in front of the fence? Some kind of erosion control? Submitted by BillyB on Thu, 06/09/2016 - 9:31am. It appears the hotel is not ADA compliant. There is a wheelchair at the bottom of the stairs on the left. Looks like the user is hobbling up the stairs to her room. I hope they didn't put her on the top floor. No light colored parasols here, just dark rain bumbershoots to hide under. I really enjoy looking at these pictures on my tablet. The spreading of the fingers zoom feature allows one to check the fine detail. Keep up the good work! Submitted by JohnHoward on Thu, 06/09/2016 - 9:08am. Submitted by Janeh62 on Thu, 06/09/2016 - 8:14am. Must have been an extra sandy experience, back then. Submitted by mailman7777777 on Thu, 06/09/2016 - 6:07am. "Hey Elmer, check out the ankles on that chick"
Submitted by John J on Wed, 06/08/2016 - 8:07pm. Edith, I swear if it get any hotter I'm going swimming clothes and all!